Huge Arena with 2 courts to have the best 12 vs 12 games or combined to accommodate huge groups of up to 50 people playing Archery Tag, Archery Dodgeball, Nerfwars together. Come experience our unique archery dodgeball game modes, take down enemies from the sniper nest and chill-out in our lounge. 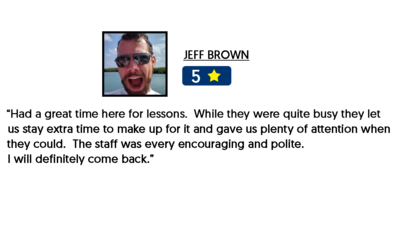 We take your combat experience very seriously, we only offer the best archery tag experience. Relax after your game in our fully air conditioned lounge area with Pool table, Foosball, LARP weapons, and the Throne of Foam. 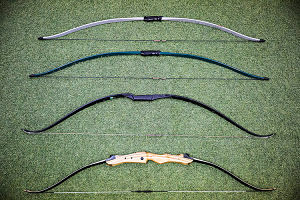 Learn to shoot a bow in the range before you enter the arena from our highly experienced set of coaches. 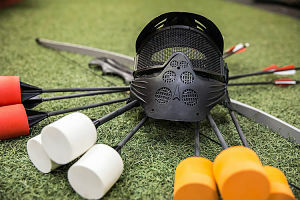 Unique Field with sniper towers that give archers the ability to Rain Arrows on unsuspecting enemies in Archery Tag dodgeball games. 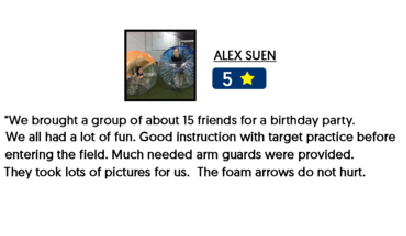 Celebrate your child's birthday with the best archery tag dodgeball toronto has to offer. Kids will leave raving about it for months. For Archery Tag we accomodate 8+ years old. 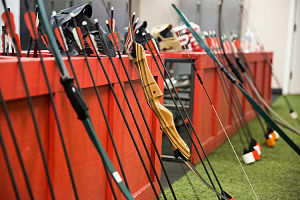 COME PLAY AT THE TOP RATED COMBAT ARCHERY ARENA IN TORONTO! You will be provided wtih an Archery Tag/Archery Dodgeball Recurve bow or Longbow; Draw weights range from 15- 29 lbs. We provide our customers with the best protection. We are the only one that provides Hockey Helmets that provide 360 degree protection that do not fog and cover the top side and back of your head. Arm guards are provided for FREE to prevent bowstring bruising. ALL OUR EQUIPMENT HAVE BEEN SAFELY TESTED, CLEANED, DISINFECTED AND DRIED AFTER EACH USE SO YOU WILL NEVER FEEL SOMEONE ELSE'S SWEAT ON YOUR FACE.